Are you or someone you love facing a life-limiting illness? Our compassionate Hospice Vaughan team is here to help. We offer a full range of customized services to support you as you navigate your end-of-life journey. All services are offered free of charge by our team of professional staff and specially-trained volunteers. We proudly respect your diversity of customs and beliefs. All are welcome. Grieving the loss of a loved one can be a complex and personal process. The first step is an initial one-on-one counselling session with a professional counsellor/facilitator who assesses your needs. This assessment allows you to set your bereavement goals. 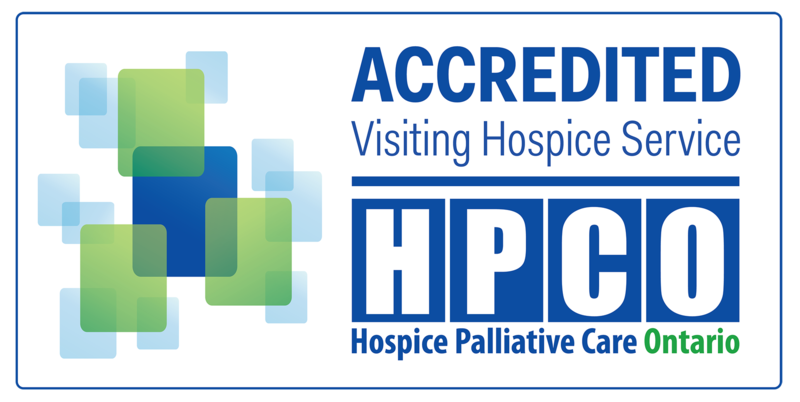 Hospice Vaughan then supports you every step of the way to healing. Specialized programs address specific types of grief and loss. You are not alone – sharing your bereavement journey with others who are facing similar circumstances can help the healing process. Surviving the loss of a loved one can be a difficult and lengthy process. We work to assist each individual to integrate life’s losses in their own unique way. A variety of support is available for bereavement clients regardless of when the loss has occurred. Clients meet with our Bereavement Coordinator and a collaborative effort is made to create an individualized care plan. A monthly meeting for clients who have already participated in a 6 week Bereavement program at Hospice Vaughan, and who would like continued group support through monthly check-ins. Teens use a multi-media platform to explore misconceptions surrounding grief and loss. This opens up a discussion around how to move forward through grief after the death of a loved one. 6-10 weeks dependent on community need. HUGS (Helping Understand Grief Sessions) is a Grief program for children created by Christine Dernederlanden. This program aims to help children understand grief and bereavement and deal with the death of a loved one. End-of-life caregivers face increasing stress and have many questions. This information and support session will address caregiver fatigue and the substitute decision-making process. Participants learn healthy ways of coping, including effective self-care strategies. Assistance with the end-of-life legal and medical documentation process is provided. Session offered on an ongoing basis. The palliative/end-of-life journey is a difficult time for the ill person and those who care for them. These therapies encourage participants to explore their inner selves, and focus on being present in the moment. Ongoing. Our specially trained volunteers provide caregiver relief and caring companionship to those facing a life-limiting illness and their loved ones. Volunteers matched with families provide social and emotional support to alleviate feelings of isolation. A palliative diagnosis by a physician is required. Our Caring Hands Day Program warmly welcomes individuals with a palliative diagnosis and their caregivers once a week. Participants enjoy socially stimulating programming, a delicious home-cooked lunch, and caring companionship. The trappings of every day life fall away, friendships are made, and laughter is the best medicine. All are welcome. Complementary therapies offer alternative ways to support those facing a life-limiting illness. These therapies encourage participants to explore their inner selves, and being present in the moment. Our specially-trained volunteers facilitate sessions covering a wide range of physical and emotional therapies. End-of-life caregivers face tremendous stress and tend to neglect their own needs. Beyond caring for their loved one, caregivers must also navigate a complex health care system. The inner resources we all rely upon to maintain sound emotional, mental, and psychosocial balance are pushed to the limits. Participants learn healthy ways of coping, including effective self-care strategies. Children will meet with others who have had a similar experience. The children’s program is offered seasonally, including in the summer. During the summer months, the program expands to a once a week, four-hour day program which includes a delicious lunch. Grief and bereavement support is provided in the elementary and high school for children and teens.